Across from its original point of inspiration — the tiny municipal airport in Redlands, California — at the end of a dusty road, surrounded by an endless field of shrub and sun-baked dirt on one side, and faded blue-black mountains on the other, stands a thin, sheet-metal structure with a silo called Hangar 24. Founder Ben Cook's journey to Hangar 24 started with a Biology program at California State and a stint in the Van Nuys, CA Anheuser-Busch Quality Assurance program just outside Los Angeles. From there, a passion for brewing turned Cook's private airplane hangar into a bit of a home-brew club at the end of a long day of flying. 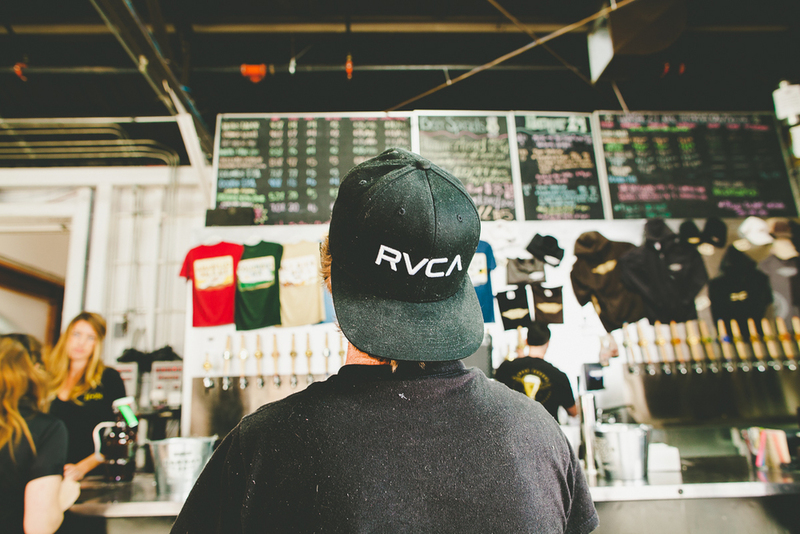 And like so many of California's up-and-coming young brewers, he eventually found his way to the Master Brewers program at UC Davis before starting his own brewery. In just a few short years, Cook has built an incredible amount of momentum, branching out from the main brewery to start his own distribution company as well. 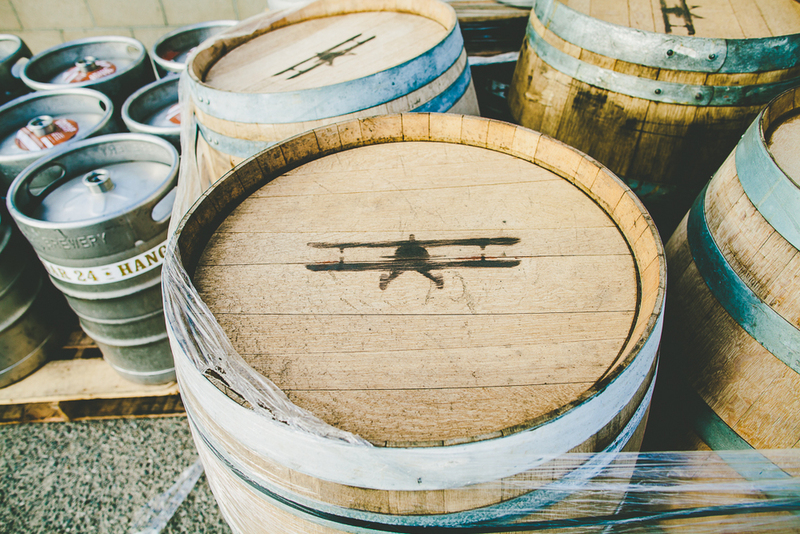 Laws in California enable ownership to extend to these related businesses, including a level of self-distribution that's enabled Hangar 24 to get into market quickly and partner with accounts that can help build the brand. Hangar 24 produce over 24,000 barrels in 2012, up 60% over 2011, and this in only its fourth year of production. This puts them on equal footing with the likes of Three Floyds, SKA, and Two Brothers in total barrels, but at double, or triple the momentum. 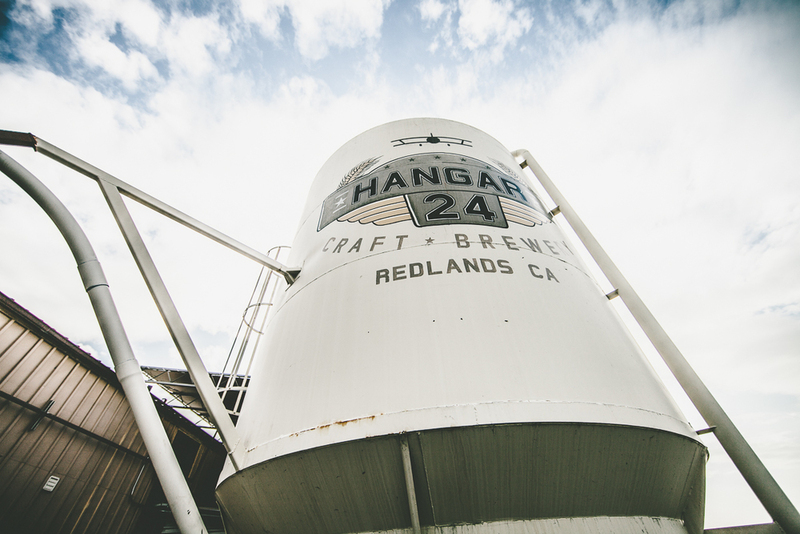 Out in the San Bernardino Valley, Hangar 24 is an oasis in the desert. But like any place in California, it's not farm from the lush field of almonds, oranges, and grapes that define so many of the flavors in the region. The Local Fields Series is an amazing effort to create beers with seasonal food notes, using both delicate and bold ingredients such as dates, red wine grapes, navel oranges, apricots, spruce, and cherries all sourced from local farmers. The Hangar 24 Orange Wheat was fresh off the line during my visit — and with a warehouse full of fresh-picked bushels from the farm, it was a powerful combination of aromatics and flavors that defined the day. 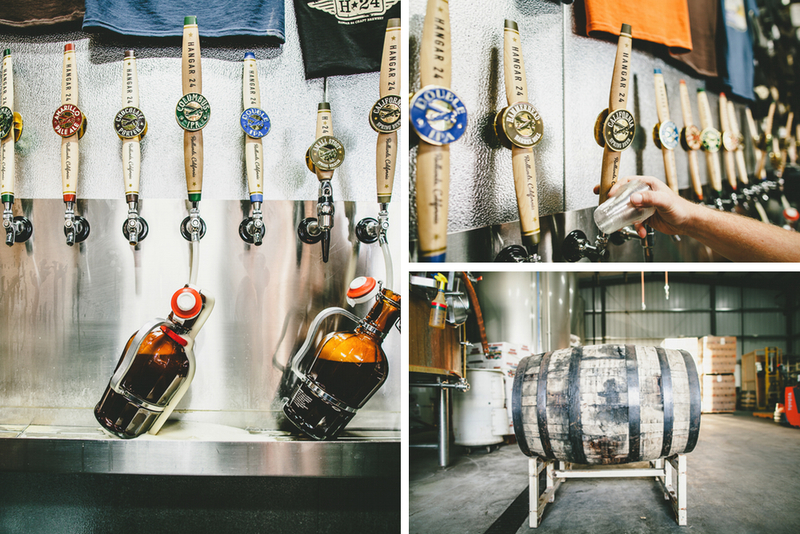 The tasting room captures the spirit of the original inspiration — a wide open hangar with the brews flowing freely. Tall overhead doors open to the ceiling to let the obtuse, late-afternoon light cut through the space. And the patio opens onto the airport across the street where small piper planes land periodically as the day winds down. 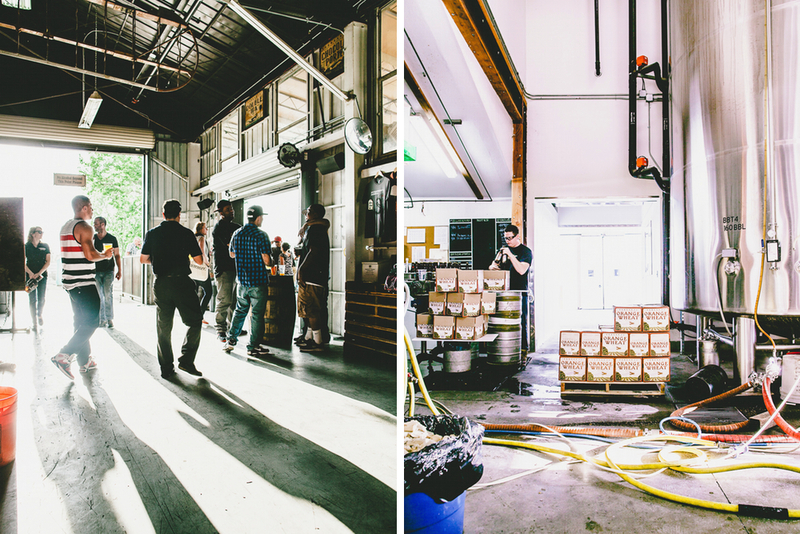 More than most breweries, there is quite a bit of strolling around, and chatter among friends and strangers alike. There's an organic quality to the space that patrons seem to react to intuitively, and its quite calming. You really have nowhere else to be right now. Forgoing the traditional table-side waitstaff and bartenders, Hangar 24 sets up a single line, festival style, that breaks into multiple service points for customers. I've never seen a bar serve so efficiently, and effortlessly. The linear system ensures that there are no bottle necks in ordering, and less foot traffic in the hangar overall. And by eliminating the seating and check-waiting game, the communal picnic table turns over quickly, and the rails all around handle the overflow of standing groups as they wander away from the taps with sparkling beers in hands. Everyone just sort of finds their way to a comfortable destination. It felt like a crowd of field hands milling around a farmhouse after a long day's harvest. 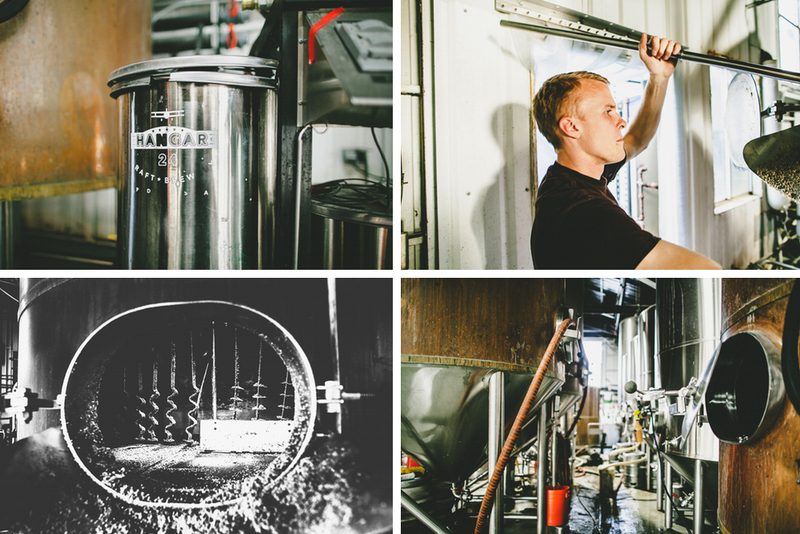 The brewhouse, on the other hand, it an exercise in constraint. 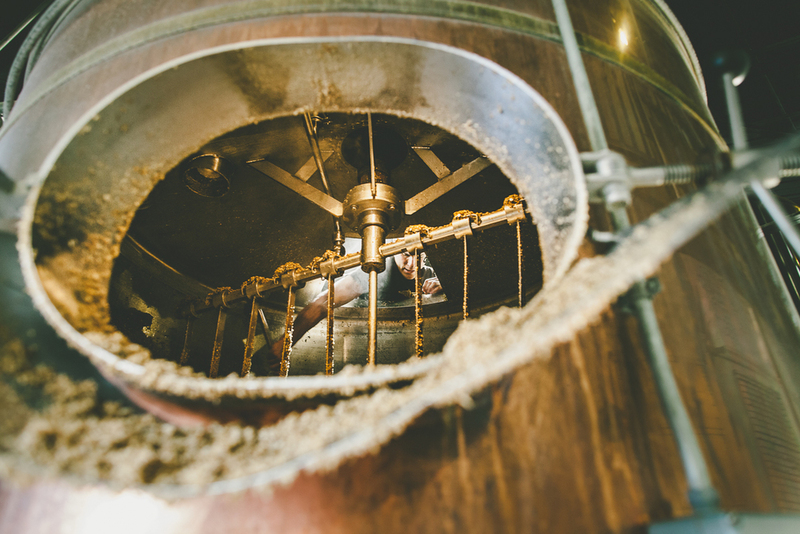 Packed into the back of the hangar, impossibly condensed amongst a warren of hoses and fermenters, the copper mash tun sits like the Wizard of Oz without a curtain. Brewer Matthew Insco was hustling that day, working in rhythm with the augur and a shovel to empty the spent grain into plastic garbage cans. The kettles are so tight against the back wall that he had to stand outside and angle the shovel in through the back door. As other upstart breweries expand their brewhouses and add more tanks to get to 7,000 and 10,000 barrels, Hangar 24's exceedingly modest digs continue to churn upwards of 24,000, with a canning and bottling line snaking out the side and into the warehouse. The flying theme is strong with Hangar 24. Each label presents an original painting of a specific aircraft (everything from sea planes, to zeppelins, to balloons) — detailed enough to lure even there nerdiest of historians. It's really quite stunning — romanticizing both the sense of flight and nostalgia for landscapes devoid of any development below. It has all the "Join us out here" quality of Leinenkugel's outdoorsiness, but with a particularly Californian, understated vibe using the ingredients, location, and a lifestyle to bring the brand to life in an authentic way. As the sun tucked itself in behind the mountains on the other end of the valley, I felt Hangar 24's oasis-like power. I had miles to go before I'd sleep — I was on my way to Palm Springs, The Salton Sea, and Joshua Tree — but part of me felt like I didn't need to be anywhere else in the world. Determined to bring a piece of the hangar with me, I loaded up on the Helles Lager, Orange Wheat, and the new California Spring beer and struck out for the desert with a hazy sort of memory, like the lone member of a caravan with a story no one would believe.